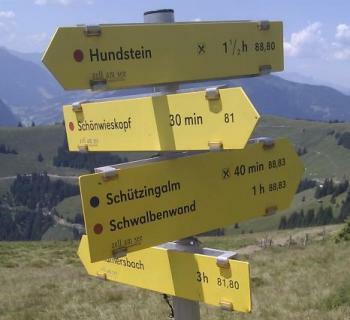 How a guidepost can be mapped and which level of detail is desired has been the topic of a thread in the German forum and a dedicated poll (not available any more). The outcome of both discussions was that people have very different opinion on how mapping should be done. Fortunately, there is no conflict between the different options, they merely represent different levels of complexity. hiking=yes / bicycle=yes — is the guidepost designated to a specific group of users? destination=* — Give the destinations as a list, separated by semicolon. time=* — The time to destination indicated on the sign. The format is „HH:MM“, giving both hours and minutes. Dieser Eintrag wurde veröffentlicht in OSM von Jan. Permanenter Link des Eintrags.